Have you ever wanted to embroider your own little garden? If you have, but you’re not sure how to go about doing it, there’s a nifty e-book available out there to show you how. 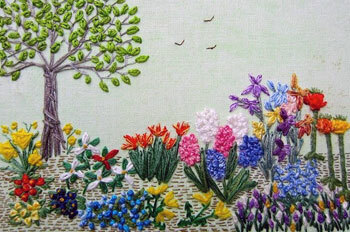 It’s called Stitching Idyllic: Spring Flowers by Ann Bernard. Ann’s little book focuses on creating your own unique embroidered garden out of recognizable flowers and trees, using very basic stitches worked in threads and combinations of threads that produce true-to-nature color schemes. Stitching Idyllic is geared towards the beginning embroiderer, but seasoned stitchers can also find good information in the book, especially if you’ve ever been drawn towards creating a unique garden scape that is solely yours. You see, Ann takes an interesting approach to embroidered gardens. She plans them much as the gardener would plan a flower garden, and she shows you how to do this. You might be wondering how each garden can be unique – aren’t there patterns for gardens in the book? No, in fact, there aren’t. That’s what’s neat about this book! You are given the tools to scheme up your own garden, and to stitch it entirely free-style, with no lines on the ground fabric. Yes, really! 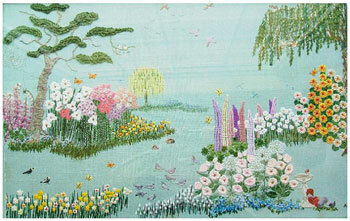 She shows you how to plot out a garden scene and then stitch it on the fabric, without drawing anything on the fabric. At the beginning of the book, you’ll find the essentials: selecting materials, setting up fabric, using a frame or hoop, and other basic introductory information. Throughout the rest of the book you’ll find instructions on how to stitch a whole variety of recognizable garden flowers, and detailed instructions on combining threads to produce the right colors needed for those flowers to be recognizable. The aim here is a realistic garden, but still “stylized” to a degree. 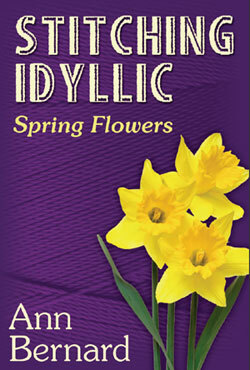 The daffodils or snowdrops, for example, are not needlepainted to look exactly like a daffodil or a snowdrop. 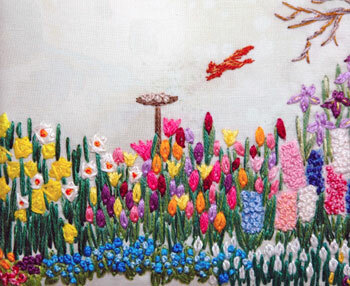 Instead, combining the right colors with simple stitches, you’ll learn how to create brilliant tulips, crocuses, daffodils, hydrangeas, irises, and other flowers that populate the spring flower garden. And they all look like what they’re supposed to be. There are no sequential how-to photos throughout the book. In fact, the stitches used are so basic that the simple drawn diagrams are enough to show you what to do to create any given flower. Detached chain stitch (or daisy stitch), French knots, a little bit of buttonhole stitch, straight stitches – these are the types of stitches we’re talking about. Simple, with really charming results! There are quite a few sample gardens stitched by Ann’s students displayed in the book, to give you some inspiration. This particular one isn’t in the book, but I think it’s a really nice example of what can be accomplished by following Ann’s pointers. 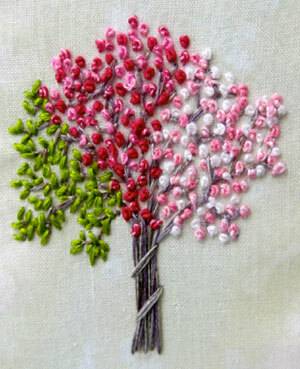 I especially like the way the running stitch was used to create the ground, and I think the tree is lovely! And the little wispy birds are a nice touch. And these bluebells? My favorite flower in the book! I think this is a great little book! True, it is not, technologically-speaking, very sophisticated, but that’s ok! The needful information is there and it’s clear, and it’s fun. The e-book is the author’s way of creating an affordable, immediately-downloadable instructional manual for stitching up pretty little flower gardens. At just under $10, I think it’s a nice value. Looks good! I love this kind of work and have a few of the Diana Lampe sorts of books too. It is so beautiful. These pictures are surely an inspiration. This is exactly what I’ve been wanting to find. Thank you so much for posting this resource book, Mary. Hehe, how many types of flowers are mentioned in the book? Oh, wonderful! I would LOVE a book like this! I could design and create a garden I would love but never have myself. Or create one for someone else. The possibilities are endless. Thanks very much for sharing this! This reminds me of the things we did in the 70s, often on a background lightly painted with washes to represent a ground bit of lake, or hill, whatever, and some sky area. I did a giant one, about 3.5′ (width of the linen) X5′, for a friend, to represent/reflect the marsh scene outside their window; she died many years ago but last time I was in that house it hung still. It took a year to make and had a lot of detail, from the marsh-mud up thru the grasses/mostly insignificant blooms, to the sky above, lots of wildlife in the detail (periwinkles, damselflies, birds, etc). They are fun to do but it’s hard to find the “stopping point” as it seems there’s always one more necessary bit. I love this book. I looked it up and it’s also available in hard copy on Amazon. Here’s the link.. I prefer a hard copy to keep over the years. My mistake… I’m just going thru the process of ordering this book and bummer, it does appear to ONLY be offered in a digital format. I guess I’ll still order it, but I’d much rather have it hard bound. Thanks again Mary for sharing. I’d love to do some of this over the summer. 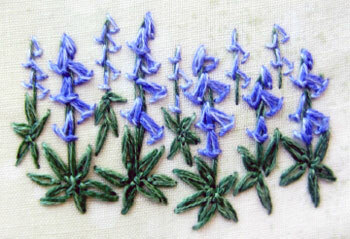 This looks really good, I don’t have a garden atm so it’d be lovely to stitch myself one. Would the pictures still be readable/look good in black and white(on my kindle) or should I get the PDF so I can see the pictures in colour? Thank you! I was thinking about doing something like this with my left over thread and just building it a little at a time. But I had no idea how to go about it. This is exactly what I needed. (Even if some of my flowers end up looking imaginary because they’re funny colors). I have just picked up my copy of this book and what a treat! Being a novice I am happy that Ann’s instructions are easy to understand and the colour chart and planning pages has been very helpful. I can’t wait to plan my very own Spring Garden piece. I absolutely love all the info you share. I was in the mood for some English garden on a scissor case. I knew you would not fail me for what I wanted. Love this ebook, but especially love that I can ALWAYS turn to you for advice! You remind me of my much loved Grandma who taught me so much while she was here. (only 103 years) This is actually a fine compliment as I am much older than you!!! Glad to think you will be able to offer your advice a LONG time! Looks like a great book – thanks for the detailed review! Next Next post: Five (x 10) Golden Rings!